This computer-generated perspective view of Hadley Crater was created using data obtained from the High-Resolution Stereo Camera (HRSC) on ESA’s Mars Express. This computer-generated perspective view of Hadley Crater was created using data obtained from the High-Resolution Stereo Camera (HRSC) on ESA’s Mars Express in this space wallpaper. Centred at around 19°S and 157°E, this image has a ground resolution of about 19 m per pixel. 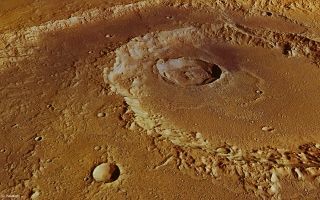 The ejecta blanket emanating from the deep crater in the middle of the image shows evidence for volatiles, possibly water ice, while the main crater rim to the top (south) of the image shows evidence for so-called “mass wasting”. This is a geomorphic process by which surface materials can move down a slope under the force of gravity. In this case, this process made the southern side of the crater shallower than its northern counterpart. This photo was taken on September 5, 2012.